How's this for a morning view? 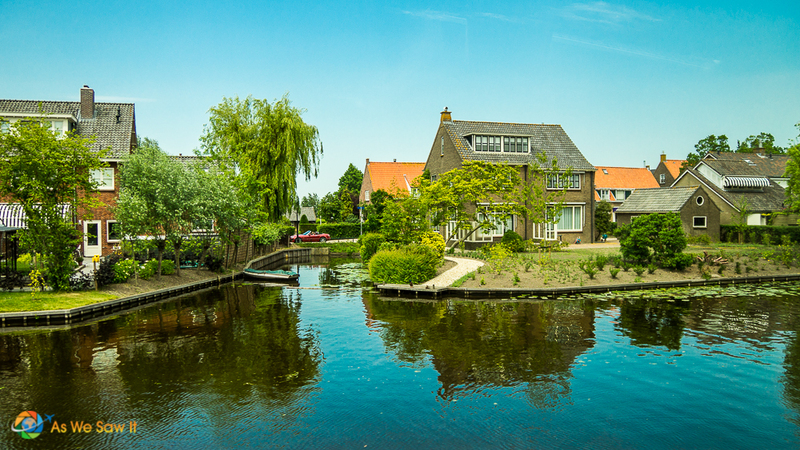 Kinderdijk was our port today, a picturesque community with 19 historic, working windmills. As well, for those repeat passengers (like us) who had already toured the site, Viking thoughtfully offered an alternative. The obvious question is, why are these particular windmills so exceptional? After all, these ingenious machines have been around since the Middle Ages and they can befound in every corner of the country. Considering that over one quarter of the country lies below sea level, for all intents and purposes Holland wouldn’t be on the map without them. Saying “you can see them everywhere” is not overstating it. But wait. I digress. We had one last morning aboard. We spent a leisurely morning enjoying one last breakfast buffet and lingering over coffee while we watched the scenery along the Rhine. The scenery had definitely changed from German to Dutch. Our Program Director Dewi was scheduled to give a presentation on Dutch water management at 10:30, so we went back to our room to pack. Since we each had only one carry-on for clothing and one small backpack for electronics, it didn’t take long. Aside from a few toiletries, a change of clothes for tomorrow, and our electronics and charging cords, we were finished before her talk began. It pays to travel light. Dewi’s talk was actually really interesting. She explained more about the expansive system of dams, dykes, and dunes that Netherlands must maintain and how concerned they are about climate change. It's especially important because the country lies even further below sea level than New Orleans. Keeping the land from flooding requires a lot more thought and preparation than I had realized! The Dutch are very water-oriented. 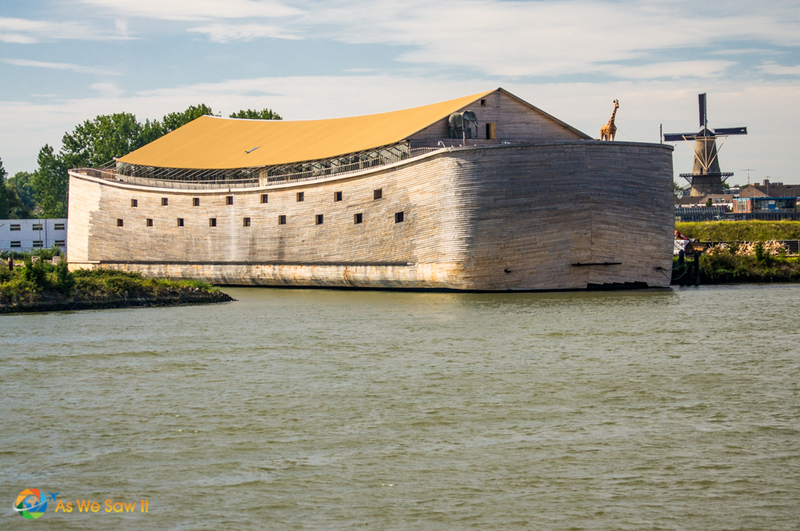 And speaking of epic flooding, there’s an actual ark in the Netherlands! When a Dutchman named Johan Huibers dreamed that the Netherlands was overwhelmed by a flood similar to the one in the Bible, he felt inspired to rebuild the ark to the same proportions that God had given to Noah. The ark is moored on the Rhine at Dordrecht, south of Rotterdam. Huibers kindly put life-sized animal statues on its deck to help give an idea of its proportions. Having seen it on our prior cruise I knew that we would pass right by it, so I made sure to tell Dewi that I’d like her to give me a “heads up” and point it out as we passed. Dewi asked the Captain to tell her when we were approaching so she could let us know. Based on her reaction I realized that it’s not a sight they normally mention, so I am glad I did. The other passengers really enjoyed the sight as well. Tip: If you want to see it the ark as you cruise by, you will need to ask your Program Director to point it out. Also, if you have time while you’re in Holland it is possible visit the ark yourself, because it has become a tourist attraction. 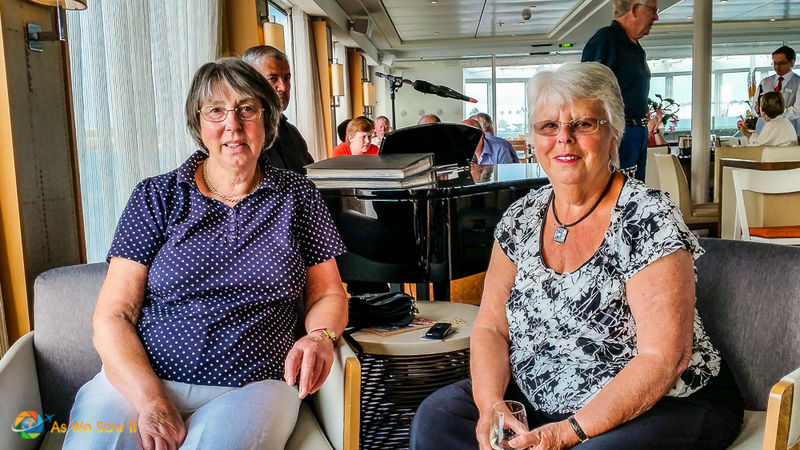 Even though both the ark and Kinderdijk (Dutch for “child dike”) are both located near Rotterdam, we had enough time on our cruise schedule to enjoy a delicious lunch. When we finally docked, we were so close that we could see the tops of the windmills from the Sun Deck. Time to do some Dutch sight seeing. 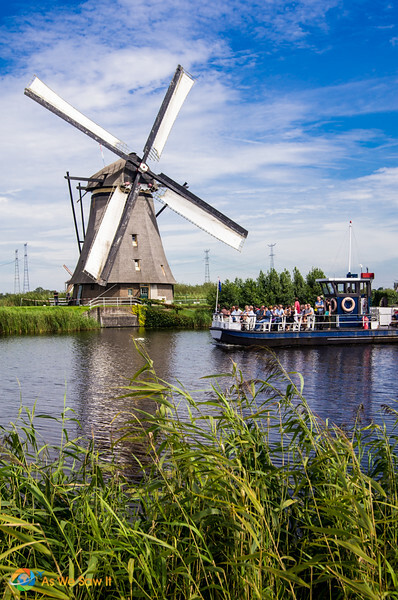 Tip: If you are unsure which activity to join, keep in mind that cheese is made worldwide, but Kinderdijk is the only site in the world with so many historic Dutch windmills. So, yeah: Given the choice, you should see the windmills. 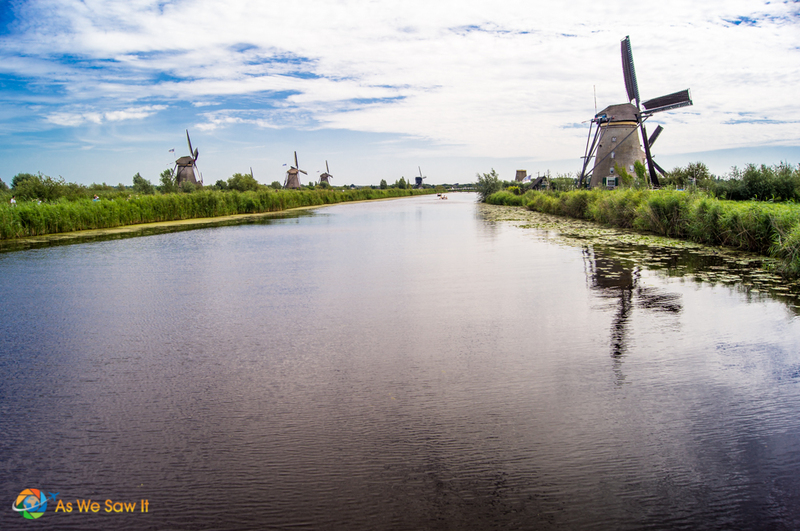 Kinderdijk is a UNESCO World Heritage Site because it contains all the typical features associated with this technology – dikes, reservoirs, pumping stations, administrative buildings – and 19 beautifully preserved windmills. Talk about a Kodak moment! These photogenic structures stand like soldiers in two opposite rows along a canal and form a spectacular sight. These windmills are still inhabited year-round and those who live in them are required to maintain them to the same standards as the 1400s when they were built. That said, the country no longer relies on windmills to stay dry. These days the country uses pumping stations and here too, the main waterworks are provided by two adjacent diesel pumping stations. Today’s included excursion gave a rare opportunity to understand how windmills work in an up-close-and-personal way, as well as to visit one of the pumping stations. 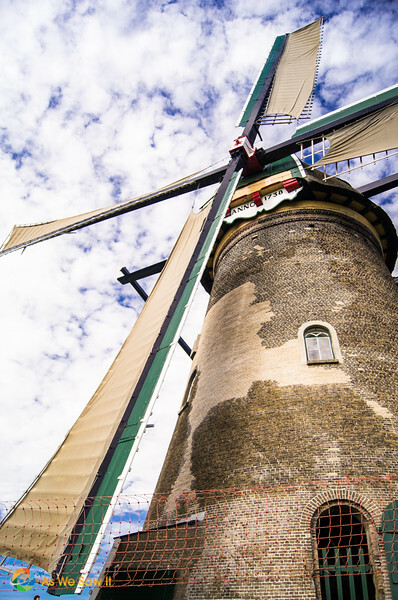 Most visitors want to climb into at least one windmill to see the pumping mechanism and living quarters. 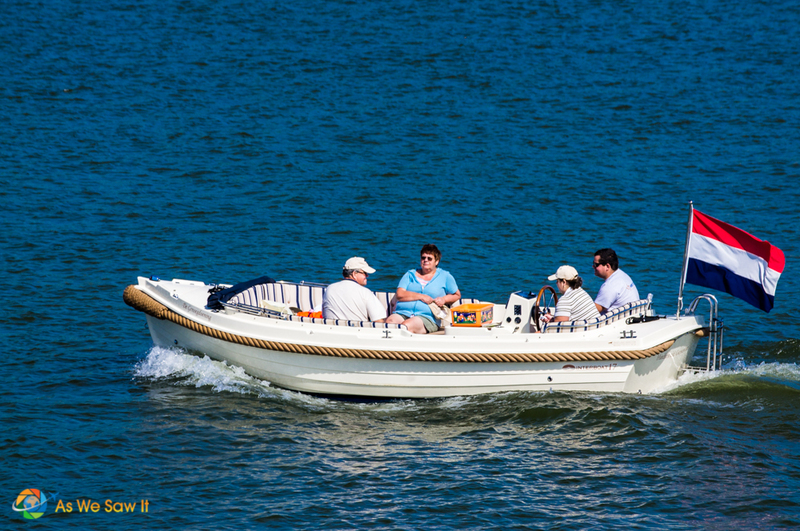 Some also took the boat around (it is suitable for wheelchairs). Tip: Entering a windmill is not a good idea if you have problems with staircases or tight spaces. 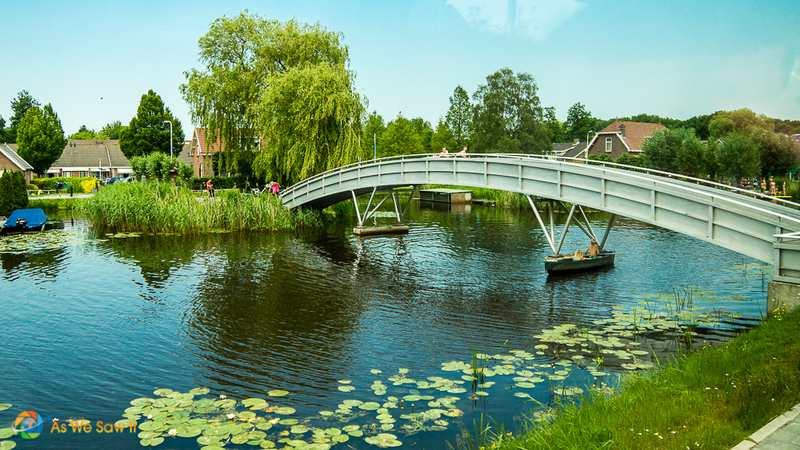 Between exploring the inside of a windmill, visiting a pumping station, seeing the museum, boating on the canal, spending money in the gift shop and taking pictures of the stunning scenery, everyone enjoyed the visit. 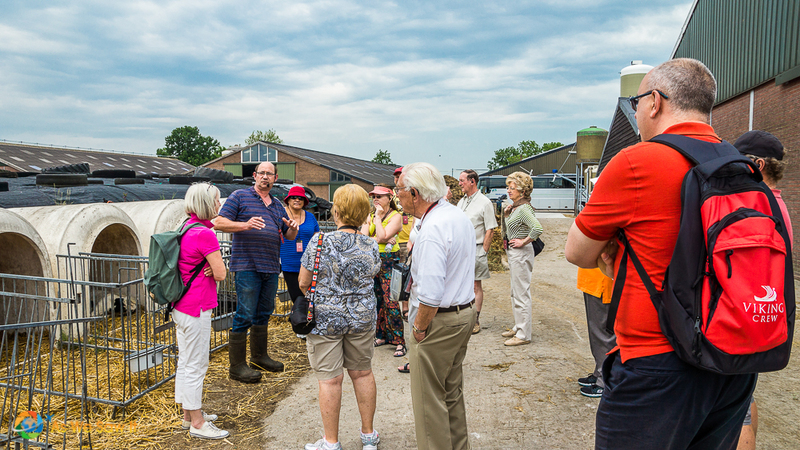 Cruisers who have seen and photographed the Kinderdijk windmills on a previous tour can opt to tour a cheese farm instead. 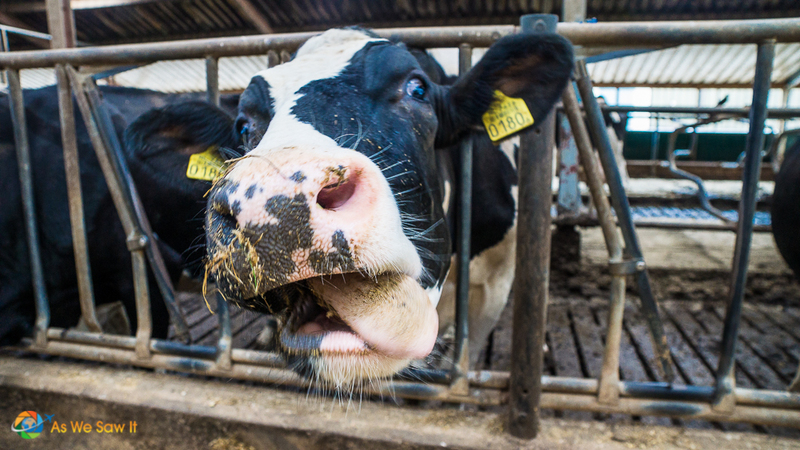 Our bus took us to a dairy farm in the town of Giessenburg. We all gawked as we drove through the sleepy little town. It was just as interesting as the farm. Certainly, we thought it was prettier! 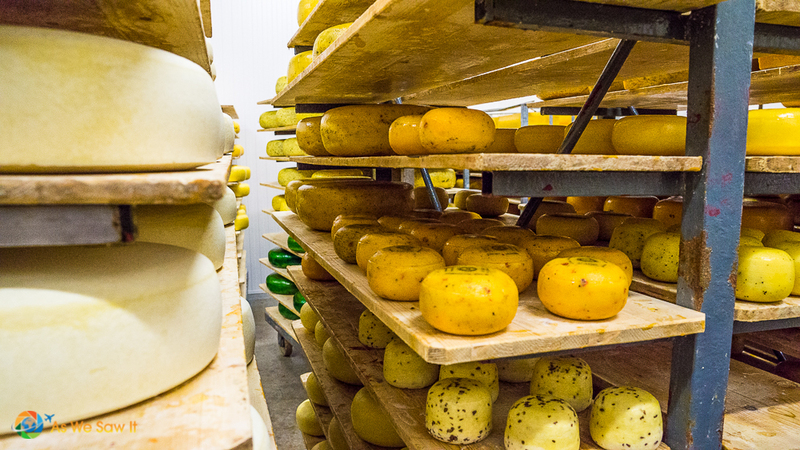 Best known for Gouda and Edam, Holland is the #1 cheese exporting nation in the world. Gouda is the most popular, and the farm we visited caters to the demand. 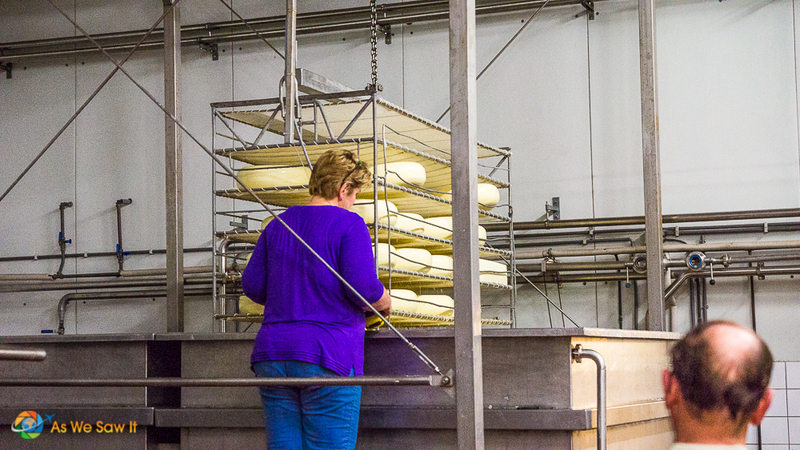 As we discovered on our tour, it is possible to produce Gouda in a ridiculous variety of flavors. The flavor gets stronger as it ages as well, and it reaches full maturity (and crumble-ability) at 2-3 years of age. And learned how they make their cheese. Gouda comes in various flavors and sizes. It becomes more crumbly as it ages. The farm has a lovely gift shop and offers samples of all their various gouda flavors. Dan and I ended up with three different types to bring back to share with our family in the U.S.
Back aboard our ship, the lobby was crowded with passengers settling their final bills. We joined the queue and missed the afternoon’s presentation on the Dutch Golden Age. Dang. I was disappointed, to say the least. It’s an interesting era in Holland’s history and I had wanted to learn more. But at least we got to spend a little more time with our new English friends, Pam and Fiona. 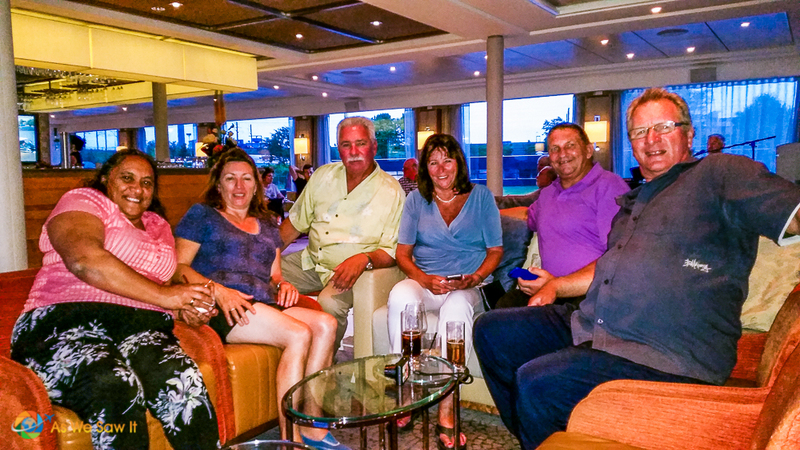 The Lounge seemed to a little more sedate after dinner because everyone had settled their bills. Once again, we were glad we had the all-inclusive drinks package. Arthur the bartender wasn't able to accept cash payments, so only those who had purchased it were able to enjoy his services tonight. Here's where it really pays to travel light: You don't have much last-minute packing to do. Those who had already prepared for departure were exchanging contact information with their new-found friends. We tried to get as many email addresses as we could, as well. Departure plans a big topic, because Viking does not include a tour of Amsterdam at the end of the cruise. I’m glad we had spent a day in Amsterdam before because we were able to help a few plan what they would do in town. Tip: Don't miss the opportunity to see Amsterdam yourself before you fly home. If you absolutely MUST fly home at the end of your cruise, at least take a canal cruise. After all, that's what the city is best known for! If you have time to fit in the highlights, you can use our top article How to See Amsterdam in One Day to help you make your plans. Lodging: Check hotel prices at Hotels Combined or Booking. Private tours: We have have had good experiences with Get Your Guide, a reputable source for booking a wide variety of local tours, attractions and activities. That's why we've chosen to affiliate ourselves with them. 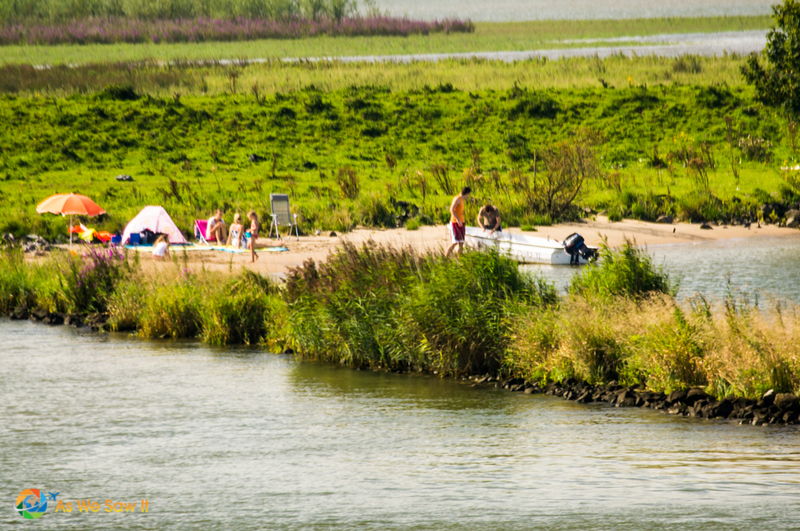 Find a list of Kinderdijk tours here. 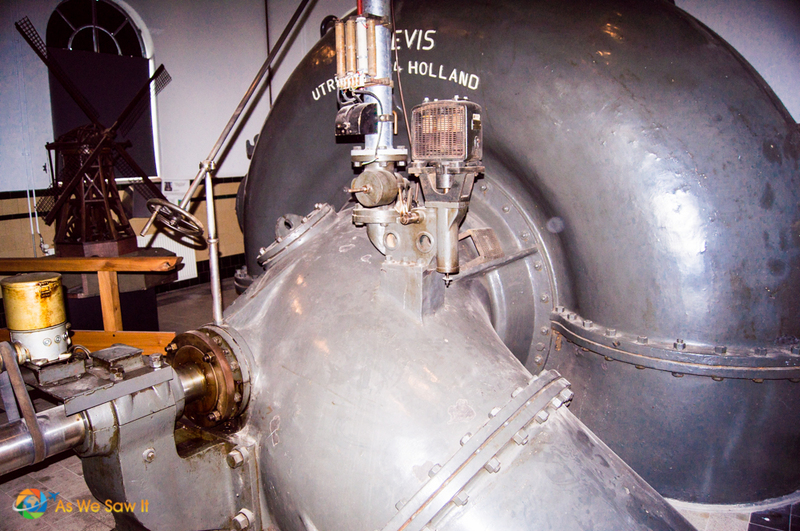 For more sightseeing, see our Kinderdijk photo gallery. Get a bird's eye view on Google Maps here. Zoom, scroll around and explore! Pin it to Pinterest or share it on Facebook. I am going here next year and I am so excited! This was so informative!!! Thank you so much! You’re welcome, Jane. We hope you have as good a time as we did. I flew home just a week ago today, from the wonderful Viking Rhine River Cruise. It was so fun to come across your photos and once again see things I experienced. 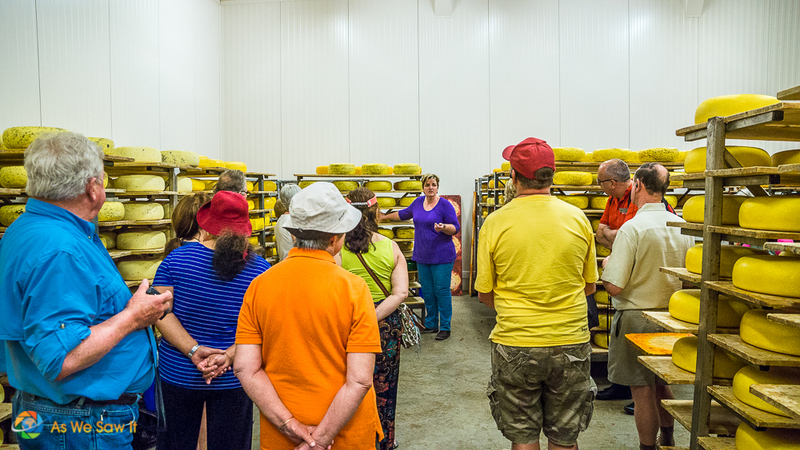 The farmer & his wife gave such an interesting tour of their Gouda cheese farm. I wish I had bought more of their cheese! Very fun to see your photos of the same countryside and windmills that we visited. Thank You! You’re welcome, Margy. We’re so pleased that you enjoyed our story. Did you take the Rhine River cruise or do the whole Grand European Tour from Budapest to Amsterdam? What was your favorite stop? 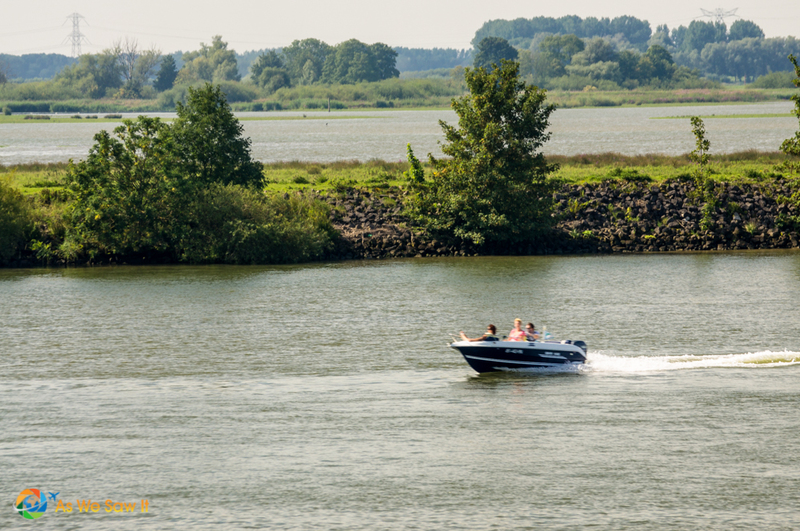 Yes, the Netherlands’ watery scenery is quite special. I’m still intrigued by that ark. Wow, that arch is amazing! I had no idea something like that actually existed! I would love to see that! I love cruises, but sometimes it’s a little hard to see everything in such a short time. Looks like you made the most of it though! Those windmills are beautiful! They reminded me a lot of the ones in Spain, in the land of Don Quijote 😀 And that cheese farm! I consider cheese it’s own food group and could never get enough, so this experience looks top notch! Free gouda samples—sign me up! We haven’t had the opportunity to see any of the Spanish windmills, but I’ll be honest: Don Quixote has come to my mind too. I wonder if Spanish manchego cheese is made the same way as gouda? I have always wanted to do a river cruise. Cruising down the Rhine would be classic. Your photos make it look so wonderful! It would be hard to decide between the windmills and cheese. I do understand you reasoning for the windmills and I know I would want gorgeous photos of the windmills too! But that gouda looks pretty good!! haha Thanks so much for sharing!! Yeah, Viking made sure that the choices were pretty good, either way. Still, our family was happy we had decided to go to the cheese farm. They enjoyed sharing the gouda! What an interesting post about Holland! I always wanted to visit the country of windmills and tulips. I love the story about Noah’s Ark replica. It must have been very interesting to visualize what it must have looked like. 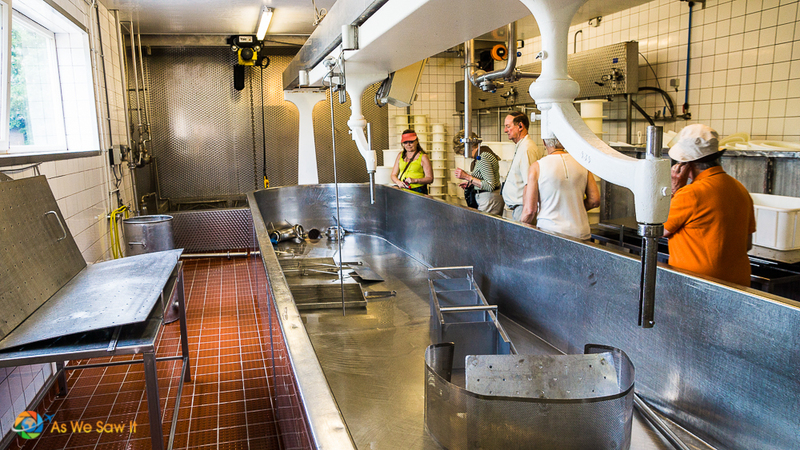 And that tour of the Dutch cheese farm… makes me want to run out the door and buy some cheese. How cute is that cow?! All of that cheese looks delish! Yes, she was cute. Dan got some really fun photos of cows while we were there. This was my favorite. What an awesome day! I remember visit Volendam and going to a cheese farm too. There were so many variety of cheeses to try. It is one of those memorable experiences you never forget. Gouda has always been one of my favorite cheeses and trying it from a producer was great. That Noah’s Ark looks interesting! Visiting a cheese farm was definitely one of the highlights because I’m such a cheese fan and like you said, it was a memorable experience. I’d have to say that my favorite type of Gouda is smoked and I was surprised that they didn’t offer it. Do you have a favorite? I can’t believe there is actually a Noah’s Ark! It’s how I imagined it to look like too. Looks like a wonderful river cruise, I do like looking at a good windmill! The next time we visit I really hope we can actually go inside and see how he’s decked it out. It sounds rather elaborate! 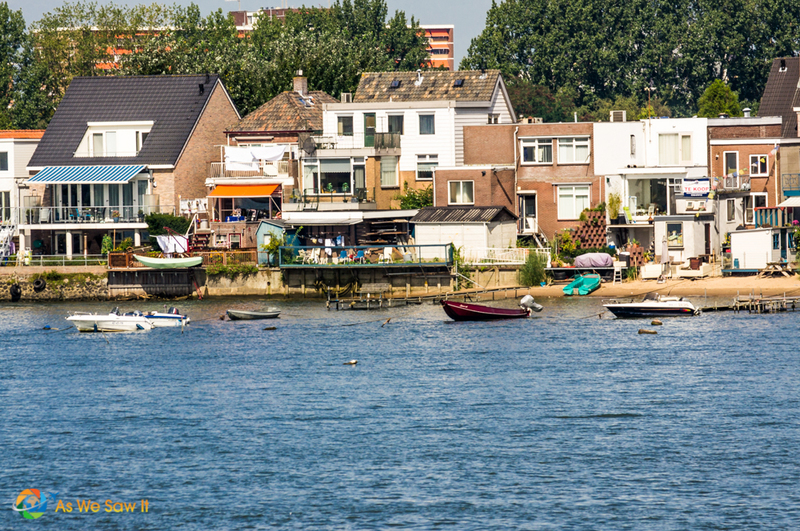 I live in the Netherlands, and it’s fun to read an outsider’s view of the place! Kinderdijk is indeed lovely, and the river cruise seems a great way to get a first impression of the Netherlands! In my experience the Dutch aren’t particularly worried about the sea level rising. They seem remarkably confident that they can deal with it, as the world’s experts on water control. I’d like to warn your readers about something else, though: taking the cheese home on the plane. Dutch cheese has exactly the same density as plastic explosives, so you are very likely to get your carry-on bag searched going through security. It’s not a problem, because they’ll see it’s just cheese, but it’s worth being aware that it’s likely. If you put it in your checked bag, you run the same risk, so leave it at the surface so anyone opening your bag will see it right away and not mess up your careful packing! Two very good tips about the cheese. I have heard that security doesn’t mind cheese as long as it’s been sliced, but that you may lose your food if it is in a wax-covered ball so they can’t verify what it actually is.